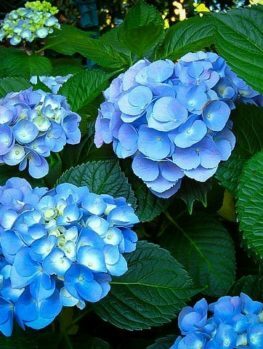 Creating the perfect yard means blending shape, color and texture to get exactly the effect you’re looking for, and one of the gardener’s most useful tools is the ever-popular hydrangea. With hundreds of varieties there’s a Hydrangea macrophylla to suit any garden, and “Peace” is one of the most striking and versatile. 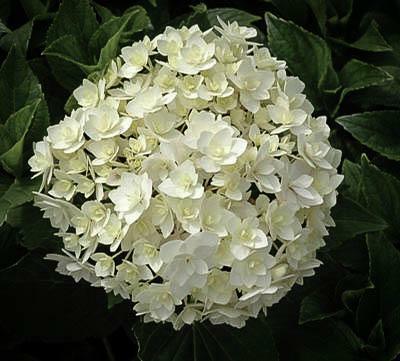 A relatively small hydrangea, it brightens your outdoor space with a spectacular display of huge white blooms. It has a long-lasting impact too, with the flowers showing from early spring until the first frosts. If you want a low maintenance but high impact flowering shrub “Peace” is one of the most exciting new reblooming hydrangea varieties, and one you can do a lot with. We’re very pleased to be able to offer this remarkable shrub and we’re sure you’ll be just as happy once a few are settled in to your garden. Practically every garden has a place for one or more medium-sized shrubs, perhaps to break up an open space or define a boundary. 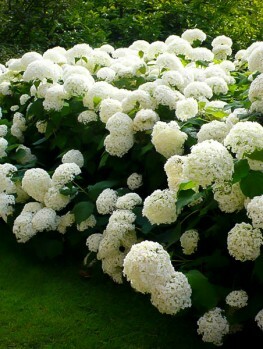 For decades, hydrangeas – with their long-lasting flowers, versatility and reasonably good hardiness – have been one of the simplest and most popular ways of achieving these effects, and with hundreds of varieties to choose from there’s no reason for that population to fade any time soon. In fact new cultivars are appearing all the time, and the Hydrangea macrophylla variety Peace is one of the most exciting of the relative newcomers. First bred in 2000 it’s already made quite an impact among gardeners, because it has a lot to offer. The hydrangea originates in the Far East, and gardeners in Japan and China have been working with them for hundreds of years. Since trade with the Far East expanded in the 19th century, however, they’ve also become popular in many other temperate countries and the United States is no exception. Millions of American yards are now brightened by these attractive shrubs and with the Peace variety becoming increasingly available we expect to see even more in the future. Peace is a new cultivar, first created in 2000 by prolific Japanese breeder Ryoji Irie at his nursery in Kyoto. 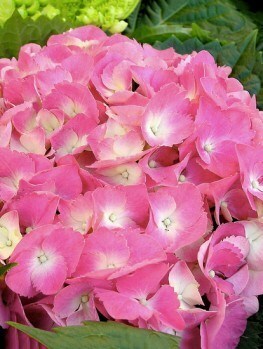 Irie has a reputation for creating spectacular hydrangea varieties and this one is no exception. 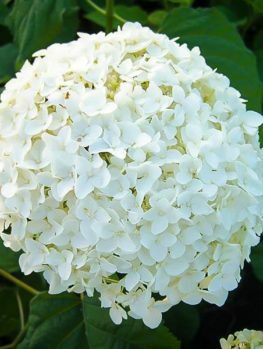 He has created a fairly small hydrangea (although larger than breeds like Perfection) that reaches a height of between three and four feet when mature. It also has quite a compact footprint, spreading to between two and three feet wide. Its stems are tough and supportive; the leaves are simple and smooth with serrated edges, and show a bright green color. What really sets Peace apart, however, is its flowers. It’s a rebloomer, so will create a spectacular display from early spring right through the year until the first frosts come. The flowers are in the classic mophead shape, forming dense clusters of double flowers more than six inches across. These clusters are particularly attractive, with an almost perfectly spherical shape. When the flowers first appear they’re a very pale green that quickly turns to a bright, clear white; as the petals age they slowly develop a hint of pink, meaning that the shrub will always present a new, interesting appearance throughout the warmer months. 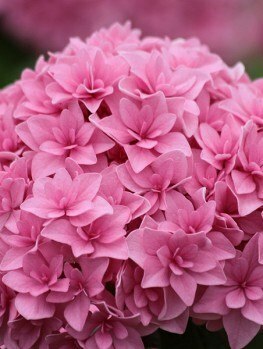 Unlike many hydrangeas, the flower color isn’t affected by soil pH so you’ll always achieve the expected hues. 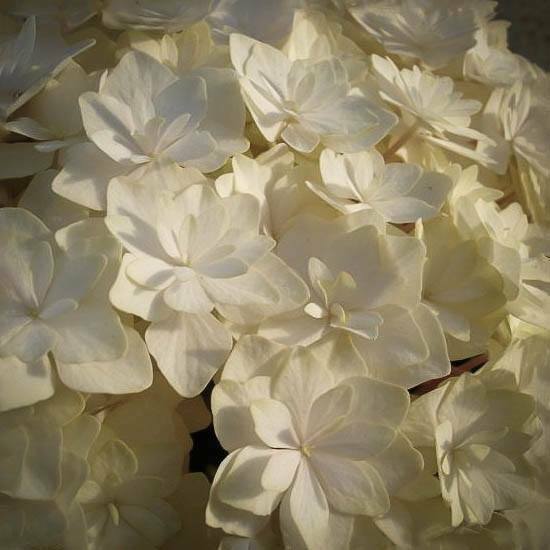 Even by hydrangea standards Peace is an unusually beautiful variety, and it’s guaranteed to enhance any space you plant one. 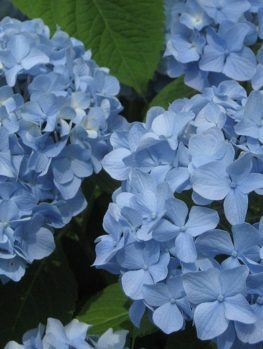 Like most hydrangeas Peace is not particularly difficult to grow. It can thrive in USDA plant hardiness zones 5 through to 9, which makes it suitable for almost anywhere in the continental USA; the only exceptions are Alaska and the northernmost parts of New England and the Midwest. It won’t tolerate dry soil though, so if you live in an area with very low rainfall you’ll need to make sure it’s regularly watered or it probably won’t survive long. Ideally it should be planted in acidic soil; it can do well in neutral soil but if you can add a touch of acidity by digging in peat moss or powdered rock sulfur that will give it a little extra help. When choosing a spot for your Peace hydrangea look for somewhere with moist but well-drained soil. Avoid heavy clay where possible. For best results choose a location that offers partial shade, with sunlight in the morning and shade in the afternoon. It can tolerate full sunlight if necessary but if you live in a very sunny region it’s going to need more watering. An organic mulch can protect the roots in summer – and, in northern latitudes, this is an essential in winter to protect against frost. Caring for Peace is simple. It will benefit from annual pruning; in early spring, before flowers start to appear, cut away all dead wood. Do this after the risk of frost has passed to avoid further damage. Once the plant is five years old do a more extensive pruning each spring, cutting away a third of all the old wood; this will promote new growth. Through spring and summer remove old blooms to encourage new ones to appear. Since Peace Hydrangea a smallish shrub it will benefit from some protection in winter. Ideally you should locate it where it won’t be exposed to the full force of winter winds. Its size is an advantage here; if the perfect location is hard to find you can easily plant it in a large container, and move it from its summer spot when the weather cools down. Otherwise screen it with burlap in winter. 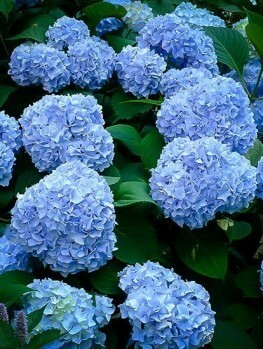 Adding one or more of these beautiful hydrangeas to your garden will bring a range of benefits. It’s a very attractive shrub and, being a rebloomer, will put on a fine display right through the summer. Its prolific flowers will attract bees, butterflies and even hummingbirds to your property, boosting local biodiversity. All in all this is a plant with a lot of advantages and every gardener should seriously consider obtaining a few. 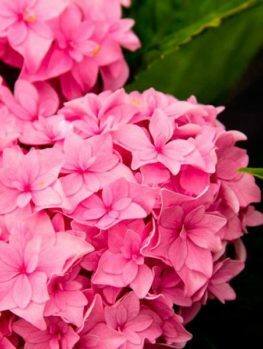 If you enjoy this plant, we invite you to browse through our collection for other unique varieties like the Penny Mac Hydrangea and the Endless Summer Hydrangea.